These tacos can be prepared in less than 30 minutes and make for a perfect Meatless Monday (or any other day) dinner. 'Pepitas' is the Spanish culinary term for the pumpkin seed. They are a nice addition to a vegetarian dish as they are a good source of protein. I found pepitas with the other nuts at our local Trader Joe's. Heat 1 tablespoon butter over medium heat in a large skillet. Add half of the portobellos and cook, stirring often, until tender and browned and very little moisture remains, approximately 8-10 minutes. Remove mushrooms to a plate or bowl. Add remaining 1 tablespoon of butter to the pan and repeat the cooking process with the remaining mushrooms. Return first half of mushrooms to the skillet and add the garlic and chipotle chile. Cook, stirring constantly, for another minute. Turn off heat and stir in the cilantro. Salt and pepper to taste. 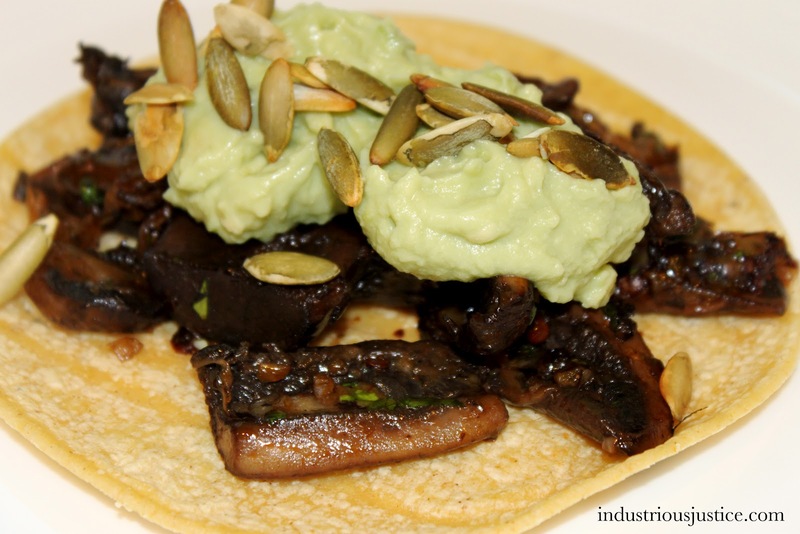 While mushrooms are cooking, make the avocado sauce. In a food processor or blender combine the avocado, sour cream and lime juice. Blend until smooth. Pour into a small bowl, cover and refrigerate until ready to use. To serve, top each tortilla with 1/8 of the mushroom mixture. Top with avocado sauce, toasted pepitas and salsa.